Mark and Ian model their new T-shirts! 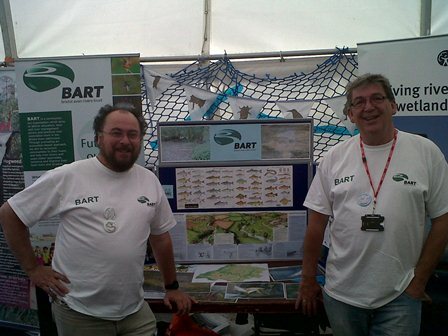 The Festival was BART’s first major public outing and it was great to see and hear the excitement of youngsters seeing the fish and bugs on display. Plenty of future volunteers! It was also good to get some of the main messages across about how damage to the health of the river can be caused. The Festival itself was a fine example of volunteering and youth in action – I was met by a volunteer on arrival, checking I was entitled to be there, let into my tent by a pair of brilliantly effective co-ordinators, clearly destined for leadership roles, and assisted throughout the day by volunteers who seemed capable of almost anything. We hope to have made an impression on some as they have offered to become involved with BART during the Summer. Challenge of the day? Explaining the word spawning to a young French chap!